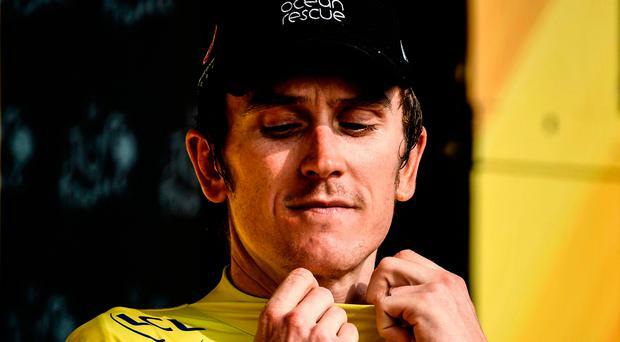 Geraint Thomas is prepared for attacks from his rivals as he faces the final mountain stage of the Tour de France today. Team Sky's Thomas retained his one minute 59 second advantage over Team Sunweb's Tom Dumoulin on yesterday's flat stage to Pau - won by Frenchman Arnaud Demare - and turned his attention to Stage 19. An imposing route will take the riders over three-quarters of the 'Circle of Death' as they tackle the Aspin, Tourmalet and Aubisque on a 200km stage from Lourdes to Laruns, and fireworks are expected before tomorrow's time trial provides the final sort-out in the general classification. "We're expecting the worst and hoping for the best," Thomas said. "We're expecting a lot of attacks straight from the gun, to go in the break or maybe on the Tourmalet half-way through and certainly on the last climb. "It's the last mountain stage and I think guys will try to take any opportunity they can. But in the back of their minds they have still got to have the time trial. They can do a big move and maybe gain two or three minutes and quite easily lose a chunk of time in the time trial." Thomas will have the rare luxury of having four-time Tour winner Chris Froome ride in his service after his team-mate slipped to third overall. "Obviously having 'Froomey' at my disposal is phenomenal," Thomas said. "But hopefully he won't have to do much. It will be a big test (for me) but I think it's more one for the team to control. The last climb will be down to legs. It will be good to keep doing what we've been doing." Yesterday was uneventful for most of the 171km. Groupama's FDJ's Demare was able to hold off Christophe Laporte (Cofidis) and Alex Kristoff (UAE Team Emirates). Somerset made it three wins out of three in the Royal London One-Day Cup after beating previously undefeated Sussex by 68 runs on Duckworth-Lewis-Stern at Hove.